Carrollton is a city in the Dallas, Denton and Collin counties, in the state of Texas, USA. It has a population of 126,700, according to the 2013 Census. The city has a lot of good facilities for its residents that ensure an easy and safe life. One of them is the availability of dentists and dental care clinics for emergency help. Emergency Dentists are saviors of life. 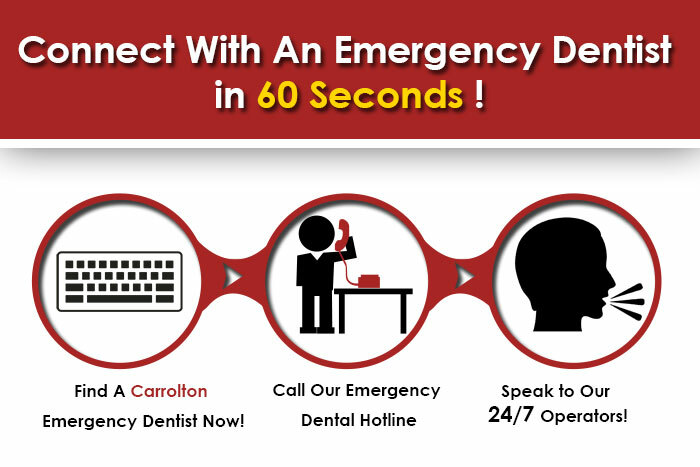 If you’ve ever had a dental emergency in Dallas city area, you’ll know this very well. They are there to help with any kind of dental problem that you may be facing. Bleeding gums, toothache, scratched dental fillings, bad dental hygiene, you name it- these emergency dental clinics can help you with anything! They have great doctors and employees who are trained to take care of patients on a short notice. All you have to do is just dial their helpline number and make an appointment. Leave the rest to them and see how they solve your problems. Carrollton Dentist provides general, cosmetic, and sedation dentistry services. Dentist Dr. Any Horton and her team of caring professionals, take good care of each and every patient individually and help them recover from dental discomfort. Their long experience of dental healing has helped them become one of the best in Carrollton. You can definitely rely on them to fix anything that’s going wrong inside your mouth. So, why hesitate, call them at 469-464-5953 or visit them directly in 2440 N Josey Ln Ste 101, Carrollton, TX 75006. Dr. Marc Dandois received his DDS from the Health and Science Center at the University of Texas at Houston in 1980. He has continued studying dentistry even after starting his own practice, which is accountable for the vast amount of knowledge and experience that he has in this field. He has studied orthodontics, endodontics, and sedation dentistry under many renowned professors of this field. He is perfectly reliable, maintains a highly professional approach to his patients, and ensures their safe recovery. He provides services in 5 different categories of General and Family, Cosmetic, Sedation, and Restorative dentistry. To contact him, dial (972)-394-7007 or visit his clinic on 1821 Golden Trail CT. Suite 220, Carrollton, TX 75010. Milestone Dental Clinic has four very highly educated and learned dental doctors who are available in your time of need. Their board of doctors include Dr. Sulman Ahmed, Dr. Shalin Patel, Dr. Salmir Dalsania, and Dr. Johny Chiem, all of whomare experienced and award-winning doctors who can help you forget your dental pains with the very first diagnosis! They offer services for emergencies and orthodontics. They even offer a Saturday Service where they take patients as willingly as on any other working day. Contact them on their helpline: 972-587-7532 or visit them at 2150 N. Josey Ln. Suite 306, Carrollton, TX 75006.